UConn won an overtime thriller against St. Cloud on Friday thanks to a golden goal from rookie defenseman Camryn Wong (Vancouver, B.C.). The Huskies completed the sweep with a 3-2 win on Saturday. Merrimack started the year 2-0, scoring seven goals in its first two games for the first time in program history. Mikyla Grant-Mentis (Brampton, Ont.) 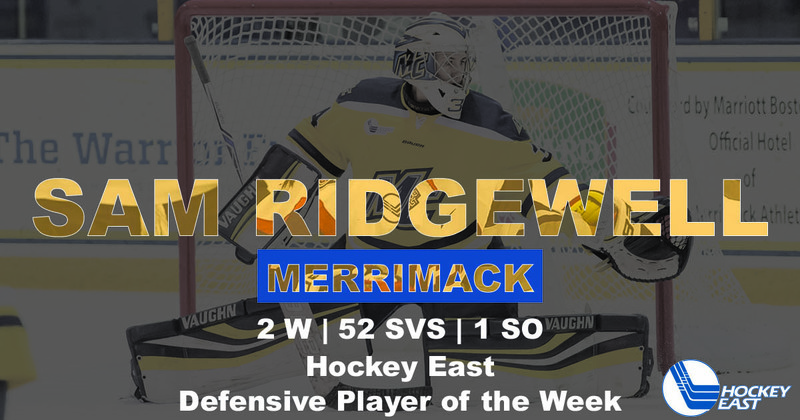 registered both game-winning goals for the Warriors in the homestand sweep, picking up Hockey East Player of the Week accolades in the process. Holy Cross made its Hockey East debut with a 0-1-1 weekend in its first two games as a Division I program. The Crusaders traveled for a road set at RIT, earning a 1-1 tie in the second game. Freshman forward Carlie Magier (Allen Park, Mich.) netted the first goal of her collegiate career in the stalemate. #4 Boston College falls twice at #9 Minnesota Duluth. The two games marked the return of Olympians Cayla Barnes (Eastvale, Calif.), Kali Flanagan (Burlington, Mass.) and Megan Keller (Farmington Hills, Mich.) to the Eagles lineup. Six Hockey East teams skated in exhibition contests on the weekend, with five claiming victory (Boston University, Maine, Northeastern, Providence, Vermont) while New Hampshire skated to a 0-0 tie in its preseason tuneup. Mikyla Grant-Mentis (Jr., F; Brampton, Ont.) racked up three goals in Merrimack’s first two games against Union, including both decisive tallies for the Warriors. 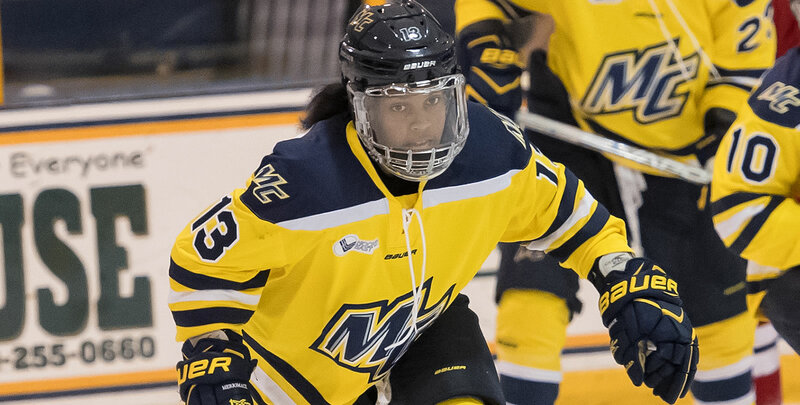 The forward finished the weekend with a plus-four rating as Merrimack got off to a 2-0 start to the 2018-19 season with a pair of home wins. Camryn Wong (Fr., D; Vancouver, B.C.) scored the winning goals in both games against St. Cloud, including the overtime strike in Friday’s 3-2 victory. 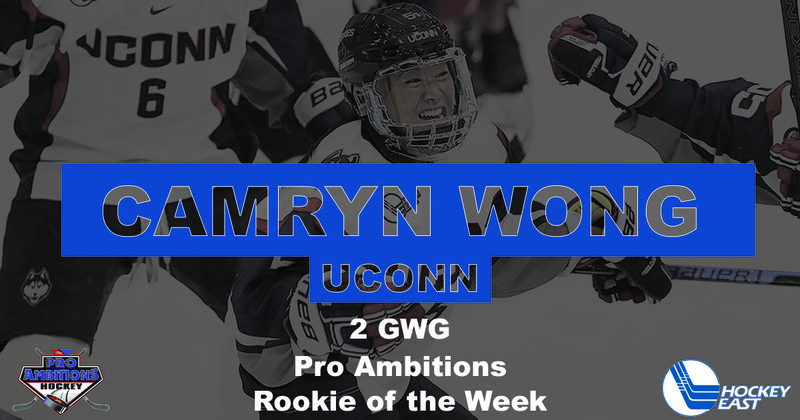 The rookie forward converted on both of the two shots on net she registered over the weekend, helping UConn jump out ot a 2-0 start on the year. Samantha Ridgewell (Sr., G; Outlook, Sask.) posted a .981 save percentage, stopping 52 shots across two games to claim victory in each outing. She allowed just one goal in two games, posting her third career shutout on Friday night against Union. Erin Connolly, BC (Jr., F; South Boston, Mass.) The junior forward had one goal and one assist on the weekend at #9 UMD. Savannah Norcross, BC (Fr., F; Lynn, Mass.) Scored her first career goal, a power-play strike. Rachel Allen, BU (So., F; Cary. N.C.) Dished out a pair of helpers in a 7-0 exhibition win over Durham West. Courtney Correia, BU (Fr., F; Whitby, Ont.) Tallied a goal and an assist the win over Durham West. Kate Stuart, BU (Fr., G; Chilliwack, B.C.) Stopped a team-high six shots in one period of play in the Terriers’ exhibition contest. Morgan Wabick, UConn (So., F; Winnipeg, Man.) Had a hand in each of the Huskies’ three goals on Saturday in a 3-2 win over St. Cloud, scoring once and assisting on two others. Jada Brenon, HC (Fr., G; Pendleton, N.Y.) Started in net for the Crusaders in a 1-1 tie at RIT in her first collegiate appearance. She stopped 29 of the 30 shots she faced. Celine Tedenby, ME (Fr., F; Ornskoldsvik, Sweden) Registered four points on two goals and two assists in a 7-0 exhibition win over New Brunswick. Alyson Matteau, ME (Sr., D; Mirabel, Que.) Scored a power-play goal and finished with a plus-two rating against New Brunswick, while firing nine shots on goal. Gabby Jones, MC (Fr., F; Westfield, Mass.) 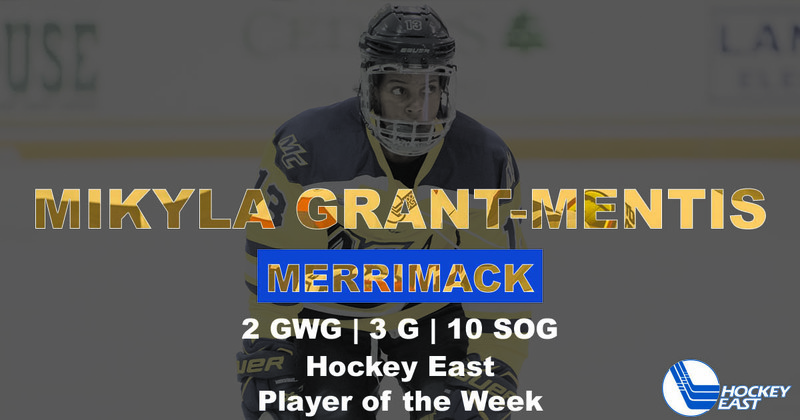 Dished out three assists in her second career game, helping Merrimack to a 4-1 win over Union to start the season 2-0. Chloe Aurard, NU (Fr., F; Villard-de-Lans, France) Scored twice to help the Huskies beat Concordia in an exhibition contest at Walter Brown Arena. Her game-winning goal came in the first frame and she finished a plus-two with three shots on goal. Maureen Murphy, PC (So., F; Buffalo, N.Y.) Earned three points (1g, 2a), including a power-play goal, to finish a plus-three in a 6-1 exhibition win. Sara Hjalmarsson, PC (Fr., F; Bakeryd, Sweden) Handed out two helpers for the Friars, firing four shots on net. Kate Friesen, PC (Sr., D; Altona, Man.) Found the back of the net and set up another tally for two points in the Providence victory. Kristina Shanahan, UVM (So., F; Ste-Anne-de-Bellevue, Que.) Potted a goal and added an assist on the game-winning goal in a 3-2 win over McGill in preseason action. Theresa Schafzahl, UVM (Fr., F; Weiz, Austria) Set up Shanahan’s strike in the middle stanza to finish plus-one against McGill. Sammy Kolowrat, UVM (Sr., D; Prague, Czech Republic) Buried the game-winning goal with 10:35 left in the exhibition outing against McGill. The defender finished plus-two with two shots on net.